Since winning the White House, Donald Trump has evinced little enthusiasm for taking on well-heeled special interests. Rather than “drain the swamp” of Wall Street lobbyists (as he’d once promised), he’s filled his administration with billionaire investors and Goldman Sachs alums. And instead of challenging the GOP Establishment’s desiccated orthodoxy, he’s given movement conservatives their ideal appointees to the Departments of Labor, Education, and Health and Human Services. But while Trump has sought to ingratiate himself with the finance industry and his party’s donor class, he has singled-out one powerful interest group for populist browbeating — defense contractors. Last week, the president-elect shot down Boeing’s stock price, by “canceling” the government’s $4 billion “order” for new Air Force One jets. The emptiness of Trump’s accusation — combined with the fact that his tweet was immediately preceded by the publication of an article in which Boeing’s CEO criticized Trump’s trade policies — suggested that the president-elect might have been more concerned with punishing dissent than reducing wasteful defense spending. But on Monday, Trump once again launched a share-price-shrinking attack on a defense contractor — and this time, he had a real point. Officials previously admitted that the new jet lacks maneuverability, that its testing is way behind schedule and that its software is still incomplete. More recently, military leaders revealed that the three versions of the F-35 jet aren’t nearly as compatible as the military had promised they would be. Plus, one official conceded that the planes are so expensive that re-equipping all of the Air Force’s fighter squadrons with them would compel the flying branch to first cut a fifth of the squadrons. And the kicker—two generals confessed that the whole idea of a do-it-all jet is, in fact, so conceptually flawed that it’s unlikely the Pentagon will attempt it again. 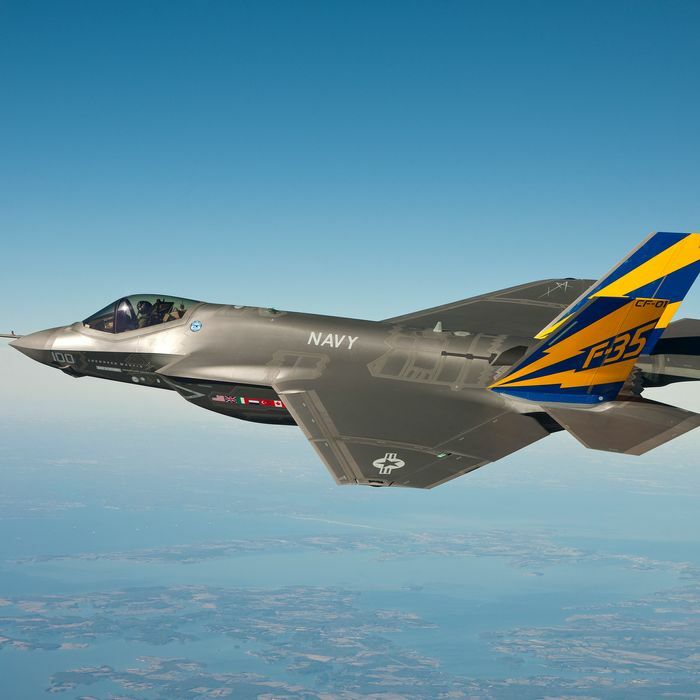 Right now the Air Force and Navy are laying plans for so-called “sixth-generation” jets to eventually supersede the F-35. So, the case for going back in time and canceling the F-35 program at its outset is exceptionally strong. But canceling it at this point — after billions have been spent, and roughly 133,00 Americans (across 45 states) have been hired to work on the program — is widely seen as politically impossible. A week before Trump’s election, the Defense Department awarded Lockheed Martin their ninth contract for 90 F-35 fighter jets, a deal valued at up to $7.18 billion, according to Reuters. Considering the sums at stake, it’s less than surprising that Trump’s tweet caused Lockheed’s stock to quickly tumble 5.1 percent (it has since recovered, and, as of this writing, is down a mere 2.5 percent). Babione went on to call the plane a “great value,” claiming that Lockheed had “invested hundreds of millions of dollars” to cut the price of the airplane by more than 60 percent. It’s hard to believe that Donald Trump is a sincere opponent of Defense Department bloat (and not just because the only belief he’s shown long-term fidelity to is faith in his own entitlement to power). In September, Trump called for a massive increase in military spending, so as to fund an additional 50,000 Army troops, nearly 100 Air Force planes, 70 Navy warships and 13 Marine battalions. There’s no inherent contradiction between the goals of cutting wasteful military programs and radically increasing our investment in defense. But Trump’s plan — with its abundance of new spending commitments and dearth of details about funding mechanisms — doesn’t signal dedication to fiscal prudence in military matters. During his campaign, Trump made a point of voicing his opposition to virtually every “deal” signed by a Democratic president — often making no substantive argument against the agreement in question, beyond the claim that his unique talents would allow him to negotiate a better one. It’s possible that this habit — and the president-elect’s sudden interest in the contracting process — both derive from a desire to advertise his (supposed) mastery at his chosen art.